Looking for romantic date ideas? How about a picnic? A little bit cheesy, yes, but there are a lot of pros in having a date like this. A picnic is good for any occasion, you don’t spend much, and you can have some privacy at last. One more reason to plan a picnic date is simple – it’s summer! Only 2 months of warmth and sun left for you and your beloved one. Why don’t you surprise your partner with a nice eve outside, with simple food, nice talk and stars above your head? 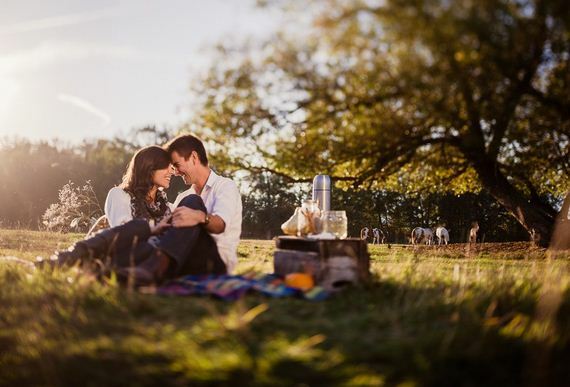 Here are several tips on planning a romantic picnic. 1. Find a Good Spot. Location is very important for your picnic planning, as you want to create proper atmosphere. Make sure you don’t choose a park with a playground somewhere nearby. Kids running around and screaming will not help you create an atmosphere for sure. Make sure you won’t be disturbed by noises or smells. 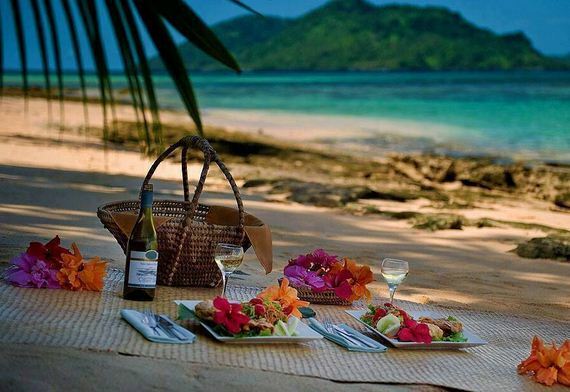 Of course, a picnic at the seaside with candles and the ocean and beach is a perfect choice. But if you don’t have an ocean nearby – just find a place with some grass and more or less pleasant views around. If the atmosphere is not romantic enough, you can change it with little effort (proceed to the next step). Don’t forget that a picnic is not only about meadows, parks, lakes and trees. Rooftops are a great alternative for a picnic date. 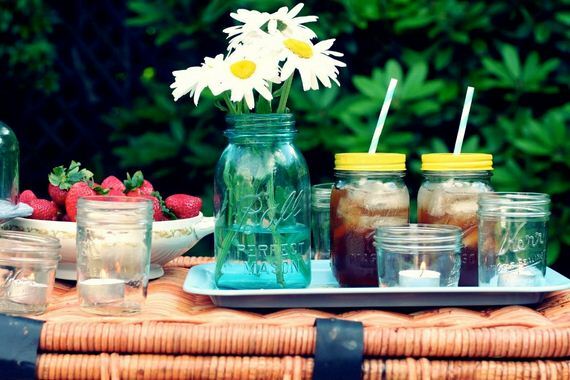 Of course, it’s for you to decide whether to make your picnic minimalistic or add atmosphere with some details here and there. If your picnic spot has flaws decorations may help to make the location more pleasant to the eye. You can make your date vintage style by taking an old-fashioned basket, candles and blanket, or add oriental touches with small pillows and decorative torches. Don’t plan a barbecue. It’s not a family holiday or the 4th of July. You will spend too much time grilling and food preparation and will regret that you didn’t have enough time for romance. It is better to take something you won’t have to cook while on a date. Choose the food that doesn’t have to be hot to taste good and that is easy to eat (it is hard to keep table manners when sitting on the grass with a glass of wine in one hand and a piece of something in another). It’s better to avoid: eggs and dairy products (these spoil quickly), fat meat, fried chicken and potatoes, burgers; any heavy food in general. 4. Dress Up or Casual? The question of picnic clothes totally depends on the location and the time of the day. 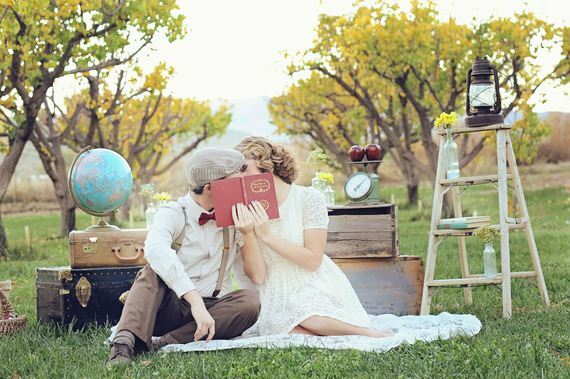 If you are having a romantic morning picnic – jeans or breezy cotton dresses will do. If you want to add some fanciness for the evening, you may choose less casual clothes and add accessories. 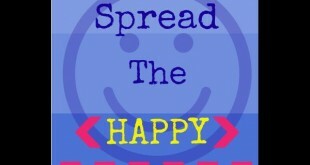 Just make sure you feel comfortable. Picnic means you will have to sit in different positions, move around, stand up/sit down on a grass. Tight skirt and stilettoes ? Nope. This kind of dress is not picnic-friendly and won’t be appropriate in this setting. Don’t forget to take: bug spray, some warm clothes in case it gets chilly in the evening, an umbrella (unless you want to get wet under the summer rain). Yes, it is a date, not a kids’ celebration, so you may think that you will find something to talk about and you will enjoy yourselves. What if not? Just imagine – you’ve eaten your dinner, enjoyed the landscape, and you can’t come up with a good theme for conversation. Will you be sitting and staring at each other or do something fun instead? You can take some table games, do a crossword puzzle together, fly a kite. Don’t be afraid that it will spoil your romantic atmosphere. You may be sure that this picnic will leave great memories for both of you.